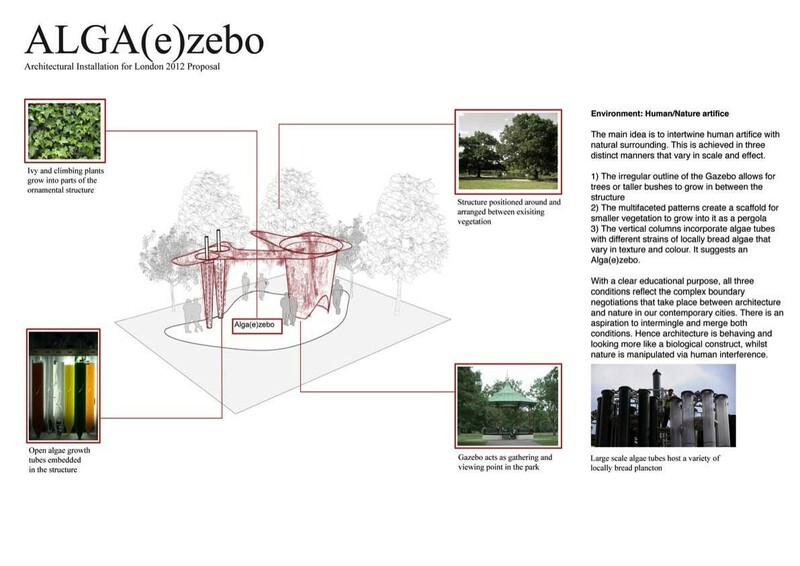 Part of the London Olympic 2012 Event, Alga(e)zebo is one of a number of temporary pavilions unveiled in the city. 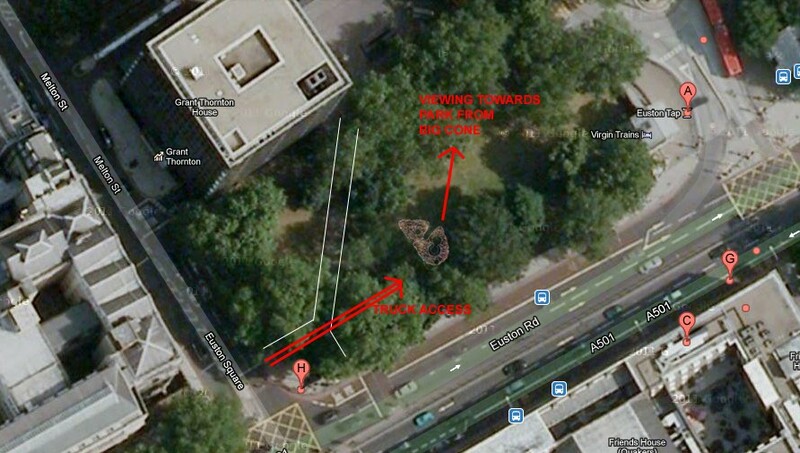 Located at Euston Square Gardens, this installation consists of a large decorative canopy-structure, a Gazebo. The concept of the Gazebo follows an English tradition in which such filigree construction becomes a jewel that punctuates the landscape, creating a small gathering or viewing point that in turn organises the natural setting around it. 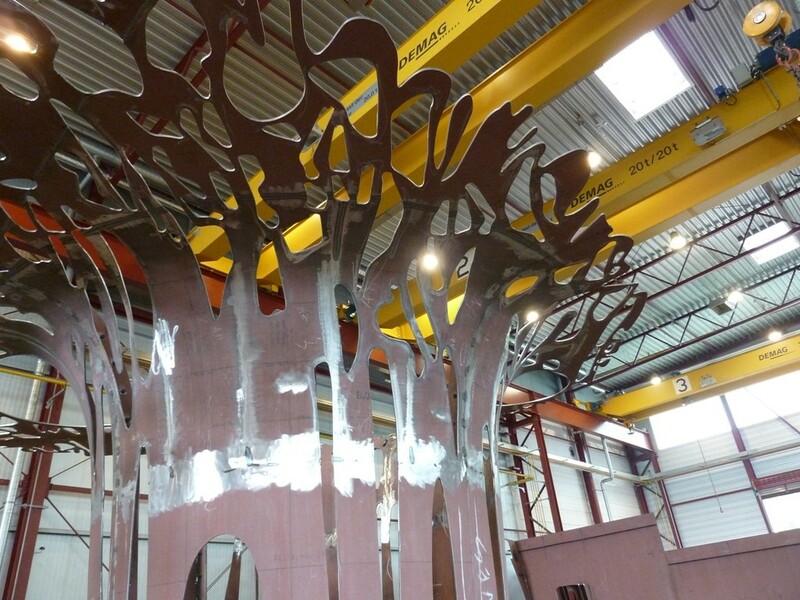 The steel structure also fits in the tradition of exposed steel paraphernalia – gates, fences, fountains, pipe work etc. – which distinguishes and enriches so many UK cities. The complex patterns of the surface create a unique ornamental structure that evokes a sense of delicacy and elegance, with an ever-changing effect of light and shadows. The internal space functions as a sitting facility for visitors to rest and gather or simply contemplate the surrounding views. The permeable boundaries of the structure, also allows for an endless play of framed vistas through and in-between it. The Gazebo also triggers associations of dynamism, indeterminacy, transparency, as well as joyfulness, festiveness and community, all of which, combined with the recyclable materiality and biotechnological augmentation of the structure makes it a potentially iconic landmark within the London Olympic setting. The Alga(e)zebo intertwines human artifice with natural surrounding. This is achieved in three distinct manners that vary in scale and effect. The irregular outline of the Gazebo allows for trees or taller bushes to grow in between the structure. The multifaceted patterns create a scaffold for smaller vegetation to grow into it as a pergola. 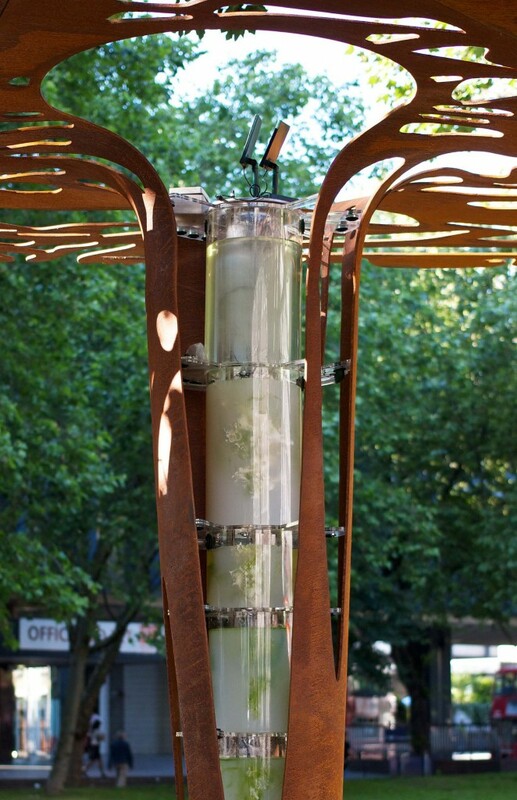 The vertical columns incorporate algae tubes with different strains of locally bred algae that vary in texture and colour. It suggests an Alga(e)zebo. All three conditions reflect the complex boundary negotiations that take place between architecture and nature in our contemporary cities. There is an aspiration to intermingle and merge these conditions; architecture is behaving and looking more like biological construct, whilst nature is manipulated via human interference. The installation makes a statement of the use of state-of-the-art technology along with interdisciplinary work methodologies. The design, with its complex geometry and perforated motifs, is originated from the implementation of sophisticated digital media processes by London-based practice marcosandmarjan. Bespoke algorithmic and parametric scripting programmes by the renowned engineering practice Bollinger-Grohmann-Schneider allow for the maximisation and design efficiency of two-dimensional processes (nesting scripting) and structural integrity in three dimensions (topological projections). World leading company Formstaal/CSI guarantees the construction out of double-curved welded steel panels manufactured from recycled steel. The resulting shell plates are then laser cut by CNC (computer-numerically controlled) machines. 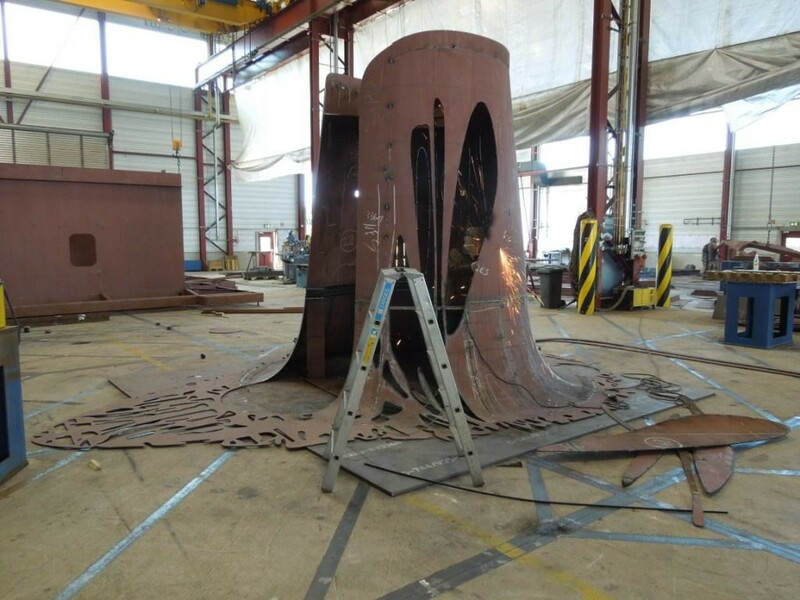 Manufacturing process of perforated double steel curvature at Formstaal/CSI, Stralsund Germany. Calculation of ornamental pattern by Bollinger-Grohmann-Schneider, Vienna Austria. The separate columns, consisting of varying volume bioreactors contain a range of different micro-organisms. From carbon dioxide consuming strains of algae to localised bacteria from surrounding gardens. The columns represent a unique real world testbed, looking specifically to see how such technology can be adapted to work within the complexity of a non standardised environment that architecture inevitably inhabits. Testing of algae insertion into different thicknesses of growth medium. 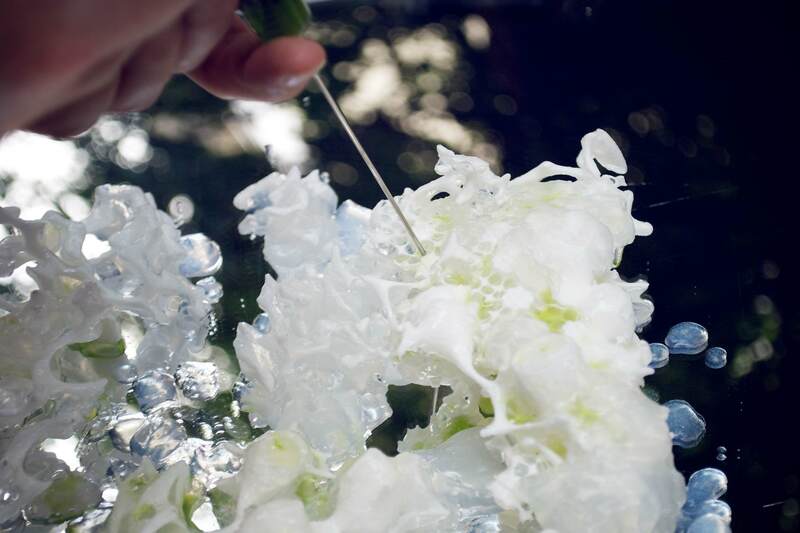 Carbon-impregnation of 3D prints, which work as a scaffold that attracts the growth of algae.